With the increasing amount of technology in our lives, it is natural that the games we once played as a child will show up in an iPhone app now. MoseCode invites your children (and you, no one will know) to play dress up with their Dress Up Studio app, for kids ages four and above. There are three templates to choose from: Reese, Emma, and Kami. Swipe across the screen to view them, and tap on one to choose. 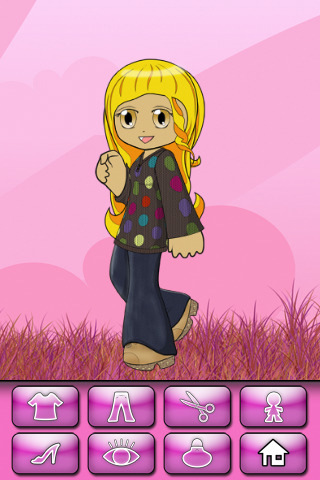 Once you’ve chosen, you will be brought to the “dress up” portion of the app. You can adjust both the girl and background: tilt the iPhone left or right to position the figure, swipe up or down to change backgrounds, or swipe left or right to move the current background around. (Bonus: tap on the background to see sparkly animations.) Once you’re satisfied, you can play with the doll itself by changing her top, bottom, hair style, skin/eye color, shoes, and even give her accessories; just tap a button on the bottom taskbar to switch to the desired article of clothing. When you’re done, tap the Home button (last one on the taskbar) to take a picture of your masterpiece or switch to another doll. Each doll comes with their own wardrobe and set of accessories (over 200 options), so you’ll get plenty of different results with each. Colorful and bright, Dress Up Studio will certainly capture a child’s attention, especially with the vaguely anime-esque features such as blue skin, cat ears, and purple eyes. However, there are only three templates to play around with, so an older child might be bored by the time they finish dressing up all three dolls–and where are the boy dolls? The music is also bright and friendly, sprinkled with a laugh-track of children’s giggles (both of which can be turned off to save a parent’s sanity). The number of distinct options is already fantastic, and the developers promise more backgrounds and dolls to come in future updates, so for $0.99 this app will be a steal. Entertaining your child has never been so easy. AppSafari review of Dress Up Studio was written by Julie Guan on March 26th, 2010 and categorized under App Store, Fun, Games. Page viewed 3354 times, 1 so far today. Need help on using these apps? Please read the Help Page.